Born in Marrakesh, Morocco, Sappho spent her childhood and adolescence in Morocco until the age of 16, then left for France and Switzerland with his parents. At eighteen, she moved to Paris. She discovered the Quartier Latin and follows one of Antoine Vitez' courses. Meanwhile, she plays some guitar in the streets of Paris. One of her friends, Hervé Cristiani - author of popular hits ('Il est libre Max') - sends her to an audition at the Petit Conservatoire de Mireille. After she finally abandoned her theatrical ambitions, the young artists takes the name of 'Sapho', after the Greek poet, and she started to persue a recording career. Her first album, 'Le balayeur du Rex' (1977), was a minor success. It already showed us an artist with an unique and strong personality. In 1980 she recorded the album 'Janis' in London, which contained alternative and provocative rock songs, influenced by the American music of the late 60s (Doors, Janis Joplin etc.). In 1981 'Le Paris stupide' followed, in 1982 'Passage d'enfer' and 'Barbarie' in 1983. These three records were all statements against racism and sexism. With 'Passions, passons' (1985), the thus far rock singer explores her roots, the Jewish-Arab world in which she grew up. At the Bataclan stage in Paris, she performs a recital with rock songs but also pays a tribute to the Egyptian music with songs of the diva Oum Kalsoum. In 1987 Sapho released a new album 'El sol y la luna', the texts once again expressing Sapho's social engagement (poverty, human rights and women's rights in particular). She performace at the famous Olympia Theatre together with a group of Gnawas (mystical brotherhood, descendants of black slaves) from Morocco. Later she encounters the Sheikhates, a traditional artist group consisting of North African women singing at parties and weddings. Always looking for new challenges, Sapho also participates in a contemporary opera by Michael Levinas 'The conference of birds' and performed as 'Jenny' in the famous opera by Bertolt Brecht and Kurt Weill. 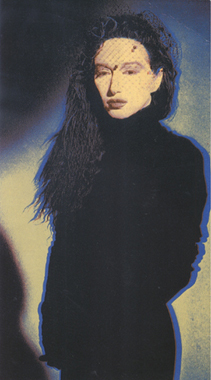 In the nineties, Sapho (or: 'the singer of the world', as she calls herself) performed at the Cigale theatre, after releasing the album 'La traversée du désir' in 1991. The album contains songs sung in Arabic, French and English. In May 1996 the follow up album is released, 'Le jardin Andalou'. This "music garden" contains various accousitc songs, highly influenced by Arabic and Andalusian traditional music. Being a sympathisant for the Israeli-Palestinian rapprochement, Sapho visits Gaza. The situation is tense, but she is determined to continue the visit. Two years later, Sapho released 'La route nu des hirondelles', again with mostly accoustic songs, influenced by Maghreb music. In 2000 she tours through France, the Netherlands, Switzerland and Morocco. She then was invited by the House of poetry in Paris, to perform texts and poems by the authors Garcia Lorca, Rilke, Baudelaire and Michaux. She also read the tales of 'Thousand and one nights'. In 2002, Sapho tours through Africa (Senegal, Mauritania, Guinea) and continued her tour through the Middle East and even visited Baghdad and Nazareth. After the tour in the Middle East, she started recording a new album, 'Orients', together with the orchestra of Nazareth, an oriental orchestra consisting of twenty musicians, Muslims, Jews and Christians, and artists fond of new technologies. The flamenco guitarist Vicente Almaraz completed the group. 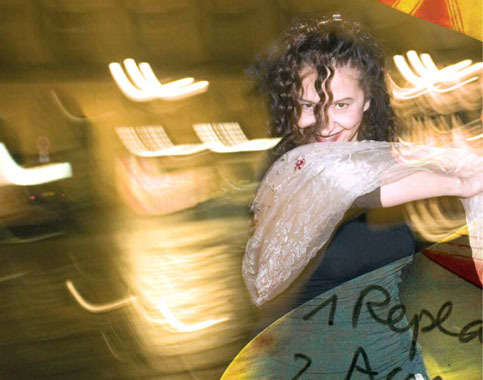 In 2005 Sapho participates in a concert in the Olympia Theatre, together with many other artists, in support of Florence Aubenas, Hussein Hanoun and Giulana, hostages in Iraq. Later that year, she started recording an album containing songs by the great French artist Leo Ferré, entirely reworked with flamenco arrangements. 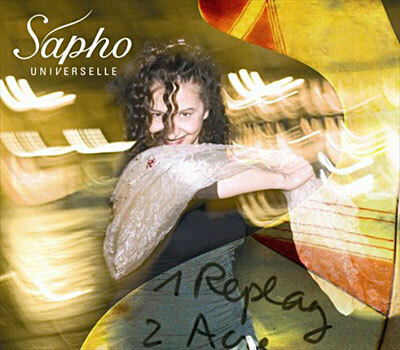 After many years, she releases a regular pop album in 2008: 'Universelle'. Sapho is a multi-talented artists. Apart from her music career, she also published several novels ('Douce violence', 'Ils préféraient la lune' 'Un mensonge', 'Patio, opéra intime') and a collection of drawings. This text contains translations of the text by Christophe Lointier/Frémeaux & Associés. PR: Great artist who did 'world music' long before it came into fashion. Her first recordings are quite punk and rock style, turning to Arabic-new wave pop in the eighties to accoustic ethno-chansons in the nineties and new millennium. She has a wonderful femanin singing voice and writes most of her own texts and compositions. Furthermore, she is a hell of a performer. I visisted her performance of Oum Kalsoum songs - definitely not the easiest musical material to listen to for two hours. But she managed to create a unique atmosphere and the whole crowd remained silent throughout the entire concert. A true artist! DB: Sapho tries to gap the bridge between oriental and western music. In fact, as far as i can remember Sapho's version of 'Endi Ouhida' (from the 'Live au Bataclan' LP) must be the first arabic piece of music i ever heard. It was a hypnotising experience where Sapho takes you on a ten minute journey which ends in a climatic wave of sound where all melodylines and instruments come together.Later on I caught her Oum Kalsoum show which was, as PAUL ROYAL already said, spellbinding, difficult as the music may seem. I love all the stuff she did before and after (although her first three albums can be somewhat hysterical). Sapho is a multitalented but restless artist. Always expect the unexpected.